The 'Days Are Gone' singers duetted with the 'Shake It Off' hitmaker at the Scottrade Center for her '1989' world tour and followed in the footsteps of a long list of celebrity pals to sing with the pop star. The trio - including Este, Danielle and Alana Haim - wore white dresses that matched the pop star's skimpy play suit and the quartet performed as backing singers to Nelly as he belted out fan favourite 'Hot In Herre'. After the rapper exited the stage the girls sang hits 'Forever' and 'Let Me Go' to the 22,000 strong crowd. 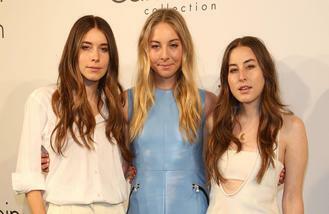 Haim - who are good friends with the 'Bad Blood' singer - took to social media afterwards to thank the star. Meanwhile, 'Riptide' crooner Vance Joy - known for performing with his ukelele - also joined Taylor on stage. The Australian's 25 minute set included a cover of Sam Smith's 'Stay With Me' and his own track 'Georgia'.